Review Summary: On the whole KAHIN PYAAR NA HO JAAYE stands on a weak foundation ? the script ? and will thus find. On the whole KAHIN PYAAR NA HO JAAYE stands on a weak foundation ? the script ? and will thus find. KPNHJ overdoes it in the schmaltz department. 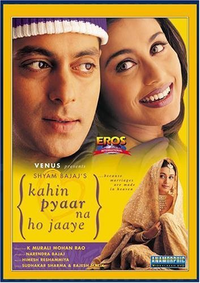 Might as well face it, Kahin Pyaar Na Ho Jaaye is about as original and as entertaining as a shirtless Salman Khan.